Following undergraduate and postgraduate studies at Lancaster and Nottingham universities I came to Portsmouth in 2004, when I joined as Lecturer in Media Studies. In January 2007, I become Principal Lecturer in Media Studies and was Subject Leader for the BA(Hons) Media Studies and combined honours degree programmes until 2011. In May 2011, I was made Reader. 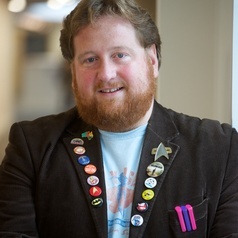 My PhD focussed on Star Trek fans and American culture and my research interests have rested mainly in the areas of science fiction, popular culture, American film and television and fandom. As I have continued to publish on fans and fan practices my research has turned to examine the cultural and creative links between audiences and the media entertainment industries; particularly the affective and nostalgic relationships fans create with media texts through production, preservation and place.